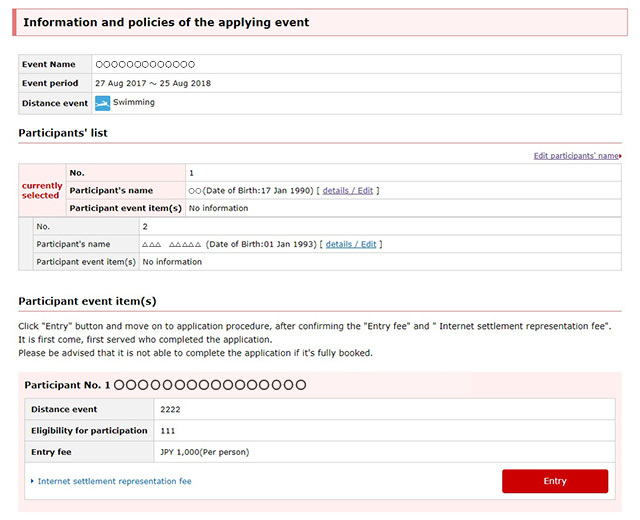 Check the contents of the event details page and click the "participation application" button in the "Event summary" column. 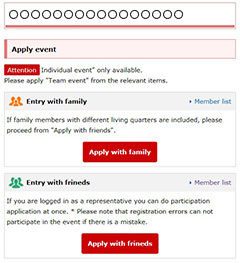 *No "Application"button for non-participating events. 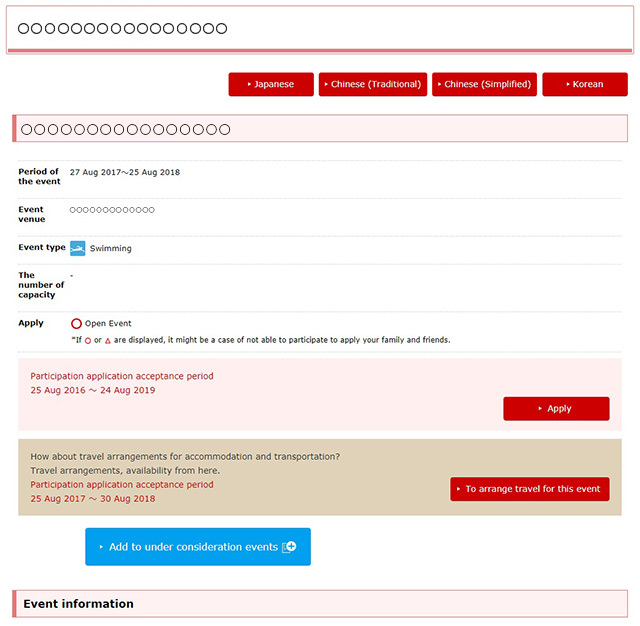 Select entry sporting event fomr application page. 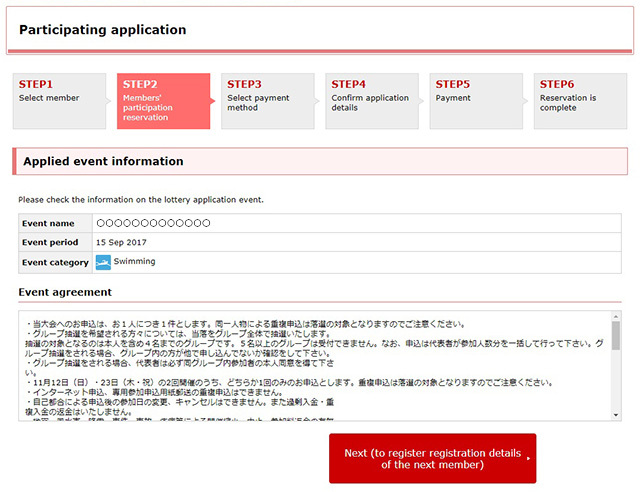 If you apply for a family member or friend, click on the "Participation application" button for the event you wish to apply to above and proceed to 【STEP 1】. Click "Apply" button and move on to application procedure, after confirming the "Entry fee" and " Internet settlement representation fee". It is first come, first served who completed the application. Please be advised that it is not able to complete the application if it's fully booked. Please choose a member who is participants this event. *Please be advised that registered member only displayed in the list. Click "+ add member (to member list)" link and go to member list. 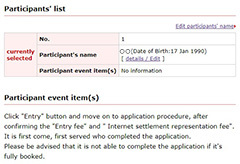 Once it moves to the member list, it is necessary to re-enter application from the beginning. Please settle member registration in the list in advance." Enter all required information and please make sure to read the event agreement for the consent for entry. A participating application for each participant. confirm the objective participants and click"apply application" button. * When changing participants, you will move to the member selection of 【STEP 1】 from the "Participant change" link on the upper right. Register application for each participant. 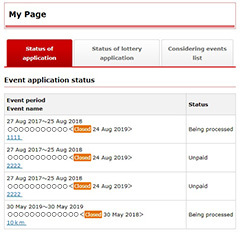 Confirm the details of the event and enter the required information. ▼ When you finish entering the last participant, click "Next (To select payment method)" button and proceed to "【STEP 3】 Select payment method". It is the same procedure as an individual or a team application after this screen. Confirm the displayed details and go to "Completion of application". After the display of "[STEP6] the completion of application", it can be checked the payment status(balance) in my page.